Your Atlanta food tour takes you off-the-beaten path to Atlanta's historic downtown neighborhoods to try 15 mouth-watering tastings from 7 restaurants and food shops. 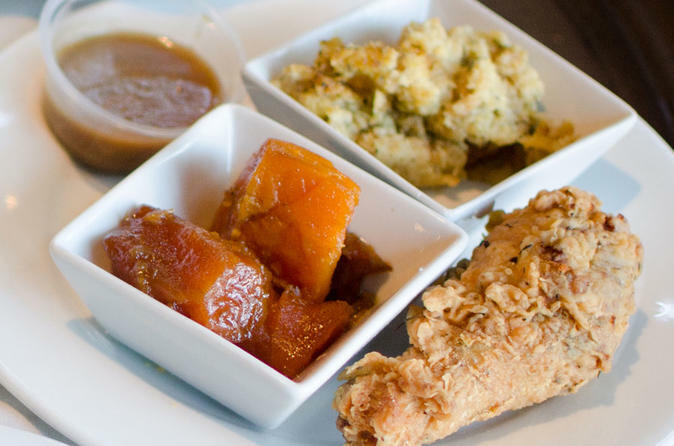 The 3.5 hour small group tour will introduce you to the history and diversity of Southern food as you try soul food, barbecue, Lowcountry cuisine, Creole-style candies, and today’s newest Southern specialties. Your guide will entertain and inform you on the easy 2 mile walk with stories and insights into the Civil Rights Movement, Atlanta yesterday and today, and the city’s food culture. In fact, some guests have said that this is the best value in the city because it's both a food tour and a history tour in one! You'll be introduced to neighborhoods and stories about Atlanta that even locals don’t know! Feed your belly and your mind with Atlanta's most unique culinary experience. Important Note: If you have food allergies or restrictions (such as vegetarian, gluten-free, or allergy restrictions) or if any person in your group doesn't drink alcohol, please advise prior to the tour. Tour includes pork, beef, and nuts, but there are substitutions if you notify local operator in advance by specifying at the time of booking in the 'special requirements' field.